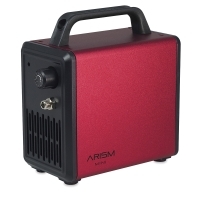 The Sparmax Arism Mini Compressor is a powerful and compact compressor designed for small work spaces and artists on the go. 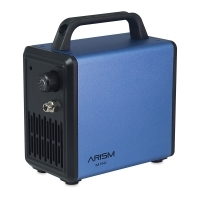 It is the quintessential compact compressor for all experience levels, and is available in eight colors. 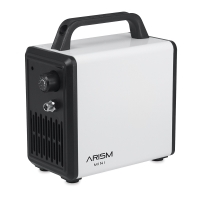 The Arism Mini features zero-maintenance, oil-less piston operation with a maximum output of 45 PSI. In keeping with its compact nature, it has a built-in airbrush holder on the handle. A 6½ ft (2 m) braided air hose is included. The Arism measures 6¾"H × 6¾"W × 3½"D (17.2 × 17.5 × 9 cm) and weighs 5.5 lb (2.5 kg).